Crochet baby hats are so simple to make! 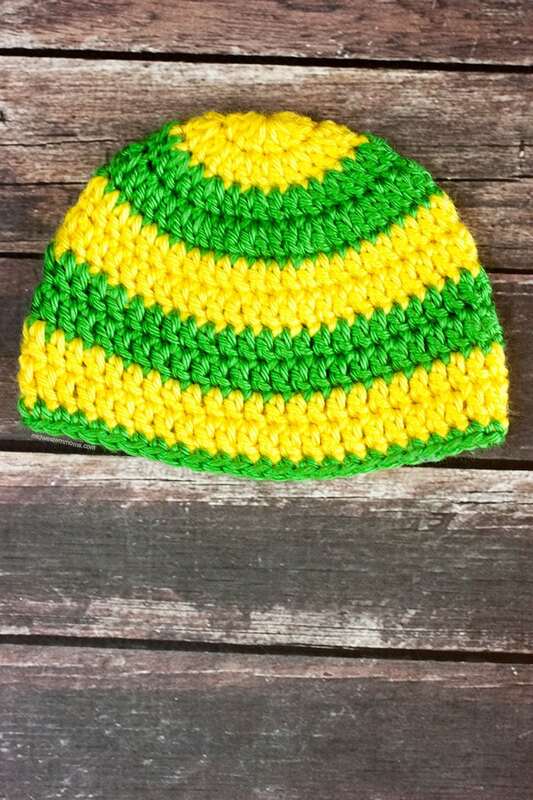 This striped crochet baby hat pattern is very easy and a great way practicing how to change colors. After making this cute little baby hat with a flower, I just had to make another one! This is very similar to the previous baby hat I made. The main difference is the color change and an extra round of stitches. I really wanted to make one in white and pink and one in white and blue….however, I misplaced my blue yarn. Only to find it after making this hat. Ha! That is the way it goes. I used Caron Simply Soft to make the hat. I used a green and yellow. Which made me think of my favorite football team, the Green Bay Packers. You will be using a new color of yarn every 2 rounds. To join the at the end of the second round, I would join with an invisible join. Then I would join the next color on to make the chain and start the next round. Makes for a clean transition of color. This pattern is for a newborn. Crochet Hat Making Templates These templates cleverly enable you to make hats in any size more efficiently than ever before using any yarn weight and any hook size Buy Now We earn a commission if you click this link and make a purchase at no additional cost to you. Round 1: (Yellow Yarn) Starting with the Magic Circle, Double Crochet 12 stitches. Join at the top of the first stitch. Pull the magic circle closed. Round 2: (Yellow Yarn ) Chain 2. Double Crochet 2 stitches into each stitch around (24 stitches). Join at the top of the first stitch. Round 3: (Green Yarn) Chain 2. *Double Crochet 1 stitch into the first stitch. Then 2 double crochets into the next. * Repeat from * to * for a total of 36 stitches. Join at the top of the first stitch. Round 4: (Green Yarn) Chain 2. * Double crochet 1 stitch into each of the first 2 stitches. Then double crochet 2 stitches into the next stitch. * Repeat from * to * for a total of 48 stitches. Join at the top of the first stitch. Cut your yarn and weave in your ends. The hat is complete. 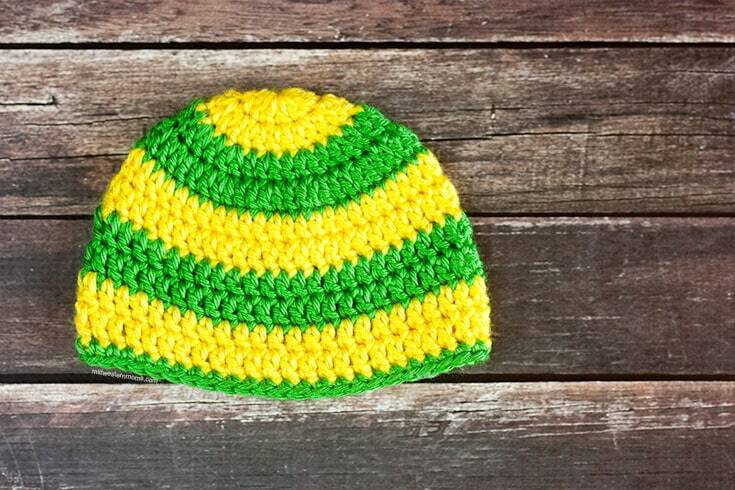 To get a free printable crochet hat measurement chat, simply enter your email into the newsletter box below. It will subscribe you to the crochet portion of my newsletter. If you are interested in other topics, please read the welcome email and follow the instructions. Already a subscriber? Great! Still put your email in to trigger the printable email to be sent to you.